The cadet trooper participates in an academy training program to learn the general duties of police work. Upon graduation from the academy, the cadet trooper is promoted to trooper and attends the state trooper academy, which includes training on department policies, practices and standards. Lateral applicants who meet the qualifications for a trooper will also be required to attend the state trooper academy. A trooper is a fully certified law enforcement officer who, under supervision, patrols highways, enforces laws and ordinances, investigates collisions, and performs related duties. Troopers are assigned to locations throughout Arizona. A cadet trooper earns an annual salary of $40,275 while in training at the Pre-Academy and the Arizona Law Enforcement (basic training) Academy (approximately 28 weeks). Upon graduation and certification, cadets are promoted to trooper (entry level), with an annual salary of $46,988. Qualified Certified Officers who laterally transfer to the agency will receive an annual salary based on the number of full time years of experience up to step 5 ($56,409.). Progression through the trooper classification is a nine step process, currently beginning at $46,988 and topping out at $65,830. Those who wish to compete as a Certified Officer must additionally meet the following qualifications (supporting documentation required). Note: An applicant MUST pass each step of the process before moving on to the next step. Additionally, if the applicant fails the physical fitness OR the written examination OR the qualifications appraisal board (QAB), the applicant MUST start over again at the physical fitness examination, even if they have passed it before and even if they have previously passed either the written or QAB examinations. Submission of completed application packet. Written examination - Applicant must pass a 100 item multiple choice test with a minimum score of 75%. Physical fitness test - The test will consist of four events: sit-ups, push-ups, 1.5 mile run and 300 meter run. Each event will be scored individually as a pass/fail. Failure of an event will result in disqualification from the selection process and the applicant will not be allowed to participate in the remaining events. Qualifications Appraisal Board - Applicant must pass an oral interview involving interpersonal skills and problem solving abilities. Polygraph examination - Applicant must successfully complete a polygraph examination. Background investigation - Applicant must pass a background investigation which includes a history of the applicant's driving, civil and criminal records, employment, and use of illegal substances. Psychological evaluation - Applicant must successfully complete a two-part evaluation including a written exam and an interview with a psychologist. Medical examination - Applicant must successfully complete a pre-employment medical exam. Applicants successfully completing the first three steps will be ranked in numeric order by combined written (40%) and QAB (60%) scores on an eligibility list. Applicants who are claiming preference points and provide the appropriate documentation (i.e., DD214, etc.) will have 5 points added to their final passing score. This documentation MUST be provided to the Department prior to the Qualifications Appraisal Board interviews. Failure to do so will preclude the 5 points from being added to the candidates final passing score. Candidates will be invited to proceed to the next phase of testing in the order of their rankings. The Arizona Department of Public Safety's patrol officer training program has been approved for Department of Veteran’s Affairs (VA) education benefits (GI Bill) for continued training. Please visit the Arizona Department of Veteran's Services Office of Veteran's Education website for more information. The test will consist of five events: sit-ups, push-ups, 1.5 mile run, 300 meter run, and agility run. Each event will be scored individually as a pass or fail. The applicant must successfully complete each testing event to continue in the physical fitness testing. If the applicant does not successfully pass the fitness exam, they must wait until the next scheduled fitness test to retake the entire test. The below listed requirements are the bare minimum requirements for physical fitness at the basic training academy. You are expected to continue to improve upon these requirements during the testing process and you will be at a higher risk of failing out of the academy if you do not. Make sure you read over the “New hire fitness recommendations” document contained within the cadet officer application packet for more information. 1.5 MILE RUN - The applicant must run 1.5 miles within the time frame indicated. The run is administered on a 440 yard track where each lap is ¼ of a mile – six laps around the track equals 1.5 miles. 300 METER SPRINT – The applicant must sprint 300 meters within the allotted time frame. The sprint is administered on a 440 yard track where approximately ¾ of a lap equals 300 meters. PUSH-UPS - This is an untimed event. The applicant will start with the palms of their hands flat on the ground with their arms, legs and back straight; the applicants’ toes will be touching the ground (this is the starting position and the position of rest, if needed). A monitor will place a closed fist, thumb tucked into the fist, on the floor below the applicant’s chest. When told to begin, the applicant will bend the elbow, keeping the legs and back straight, until the chest touches the monitor’s fist and then return to the starting position – that is the definition of one complete and proper repetition. The applicant will do as many complete and proper repetitions as possible until muscle failure is achieved. SIT-UPS - The applicant will start by lying on the ground on their back with knees bent at a 90 degree angle and feet flat on the ground. A monitor will hold the applicant’s feet in the only permissible way: The monitor will place the webbed area of each of their hands on top of the applicant’s feet and wrap their fingers around the applicant’s foot and press down; this is all the assistance the applicant will receive from the monitor. The applicant will utilize their abdominal muscles to bring the torso, shoulders and arms upward (up) until the elbows touch the knees, while at the same time exhaling, and then return to the start position, while at the same time inhaling. The start position is the “down” position. This will continue as many times as possible for one minute. The applicant’s hands must be placed behind the ears, with the fingers not interlocked. The fingertips must remain in contact with the back of the head at all times. If the applicant needs to rest during this exercise, the position of rest is the “up” position. At least one ride along with a trooper is highly recommended. The ride along application (which must be completed by the applicant and approved by a DPS supervisor prior to the applicant being scheduled by DPS for a ride along) can be downloaded by clicking here. The completed ride along application must be returned to the nearest Highway Patrol field office in relation to where you would like to do your ride along. Please DO NOT return the ride along application to the ADPS Headquarters in Phoenix as Headquarters is not a field office. 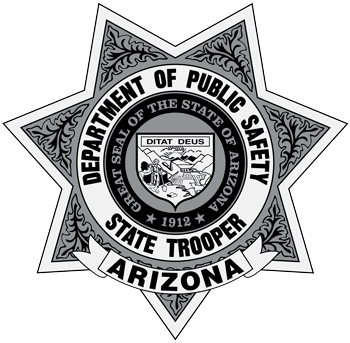 The Arizona Department of Public Safety is seeking to fill 20 lateral trooper positions, and is accepting applications from current AZ POST certified peace officers. Although troopers can be assigned anywhere in the state of Arizona, the Highway Patrol Division has identified specific positions in areas around the state that are designated a priority at this time. A list of those locations will be provided at a later date. Interested peace officers who hold a current AZ POST certification may apply here. To become an Arizona State Trooper, lateral applicants are required to successfully complete the following: standard physical fitness test, Qualifications Appraisal Board (QAB), written examination, firearms qualification, drug screen, background investigation and polygraph, and psychological and medical examinations. Once hired, lateral candidates are required to complete only the State Trooper Academy. Contact Sergeant Glueck at [email protected] or (602) 223-2061 if you have any questions. A description of the benefits from the Arizona Department of Public Safety can be found here.